Chris Bradshaw was bitterly disappointed after Desborough Town’s hopes in the ChromaSport United Counties League Knockout Cup were ended in the semi-finals for the second season in a row. 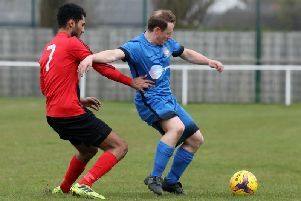 Ar Tarn took the lead against Leicester Nirvana at the Waterworks Field on Tuesday night thanks to Jason Turner but two second-half goals secured a 2-1 victory for their Premier Division rivals, who will now play Yaxley in the final. Desborough, who enjoyed a fine run in this season’s FA Vase, were beaten by Wisbech Town at the same stage of the UCL Cup last year. But, despite that disappointment, Bradshaw insists his team must aim to finish their league campaign on a high note as they prepare to travel to Kirby Muxloe tomorrow (Saturday). “I have wanted to bring something into the club and that was another chance to move closer to doing it and it was very disappointing to fall at the semi-finals again,” said the Ar Tarn boss, who saw his team beaten 2-1 by Cogenhoe United in the league last weekend. “We wanted to do well in the cups this season and, to be fair, we have but we are obviously frustrated not to have got to the final. “I have to be honest, I was hoping it would rain all day because we have had a lot of injuries in our defence recently and when you play a semi-final, you want to do it with your strongest possible team and we weren’t able to do that. “That’s not to take away from those who played because they worked hard, it was just frustrating. “But what we have to do now is make sure we turn up for the rest of the season. “We are sitting in 10th place, which I don’t think is good enough, and I think there’s an opportunity to move into the top six or seven. Cogenhoe’s win at Desborough was their third in a row and they face another in-form team at the weekend when Wellingborough Town make the short trip across the county to Compton Park. The Doughboys have been flying under new boss Nathan Marsh with last Saturday’s 4-1 victory over Harborough Town making it 11 points from a possible 18 since he took charge. Rothwell Corinthians face a tough test as they travel to title contenders Newport Pagnell Town. Corinthians are currently without a win in their last nine matches but did halt a run of four defeats in a row with a 1-1 draw against Peterborough Northern Star at Sergeants Lawn. Whitworth’s struggles towards the wrong end of the table continued with a 3-0 loss at Deeping Rangers last week and they will hope to bounce back when they entertain Daventry Town at London Road. The big game of the day in UCL Division One this weekend is at Hayden Road as Rushden & Higham United take on runaway leaders Pinchbeck United. The Lankies remain in the shake-up for the second automatic promotion place as they have three games in hand on second-placed Raunds Town, despite trailing them by 10 points. The Shopmates, meanwhile, can now be overhauled by Potton United after Jim Le Masurier’s team suffered a 2-1 defeat at Olney Town last Saturday. They will bid to bounce back when they head to bottom side Stewarts & Lloyds this weekend. It’s been a mixed week for Burton Park Wanderers. Two goals from Stuart MacMichael gave them a fine 2-1 success at Buckingham Town last weekend but they were brought back down to earth as they went down by the same scoreline to Lutterworth Athletic at Latimer Park on Tuesday night. Thrapston Town were big 6-0 winners over Huntingdon Town last Saturday and they will hope for the same again at Lutterworth Town while Irchester United also hit the road as they head to Melton Town.